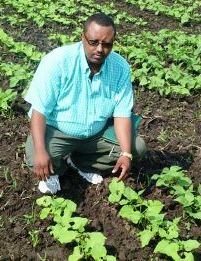 Asrat is a bean breeder at Ethiopia’s South Agricultural Research Institute (SARI) at the Awassa Research Centre. Besides breeding beans that will better battle drought, Asrat’s team combines drought tolerance with resistance to the bean stem maggot (BSM) – a pest that afflicts all bean-growing zones in Ethiopia. 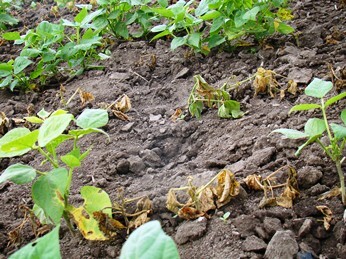 The Tropical Legumes I (TLI) was not an entirely new connection, as Asrat’s involvement with GCP predates this particular project. He started off as a GCP-funded fellow in 2007, investigating bean genetics for drought tolerance. The fellowship would also seem him do a stint in Colombia at the International Center for Tropical Agriculture (CIAT, by its Spanish acronym). 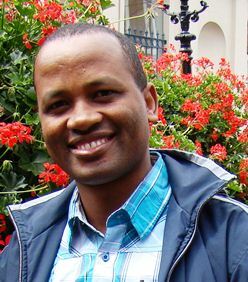 His work at the time on root phenotyping and quantitative trait loci (QTL) analysis has since been published. Thorugh GCP, Asrat also attended a molecular breeding course at Wageningen University and Research Centre in The Netherlands. Wageningen is a GCP Consortium member. The ravages wrought by bean stem maggot. And it’s not all about material but also matters cerebral (and matters manual, as we shall see further on): “From the science meetings we attend, we’ve also gained valuable new contacts and acquired new knowledge.” Asrat reveals. The next step is to validate the workability of MARS, and SARI has a GCP-funded PhD student, Fistum Alemayehu (pictured right), registered at the South Africa’s Free State University and conducting his phenotyping in Ethiopia, alongside other well-trained staff that SARI now has. 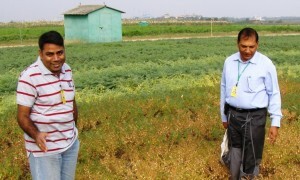 Fistum is working on marker-assisted recurrent selection for drought tolerance in beans, while Daniel Ambachew (pictured left), another GCP-funded MSc student enrolled at Haramaya University, Ethiopia, is evaluating recombinant inbred line populations and varieties for combined dual tolerance of drought and bean stem maggot. Both students are using molecular breeding: “For this work, we’ll be using SNP* markers. 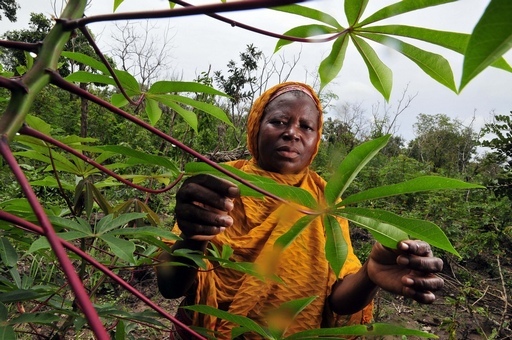 It is probably the first use of bean SNPs in sub-Saharan Africa. We will now do QTL analysis with the bean population we have from CIAT,” reveals Asrat. * SNP: (pronounced ‘snips’) is a technical term, and the abbreviation is derived from ‘single nucleotide polymorphism’ – an advanced molecular-marker system widely used in genetic science. You can read more about SNPs in this press release. 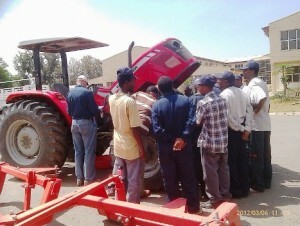 A training session on maintaining farm machinery. Moving on to matters manual and mechanical, besides enhanced human resources, SARI has benefited from infrastructure support as part of GCP’s comprehensive capacity-building package: the Institute now has an irrigation system to enable them conduct drought trials, and SARI technicians from more than 20 different SARI stations have been trained in proper use and routine maintenance of farm machinery. SARI also received two automatic weather stations from GCP for high-precision climatic data capture, with automated data loading and sharing with other partners in the network. Through this project, SARI is now well tuned into the international arena of bean research and development, and profiting in new ways from this exposure to growing international connections. 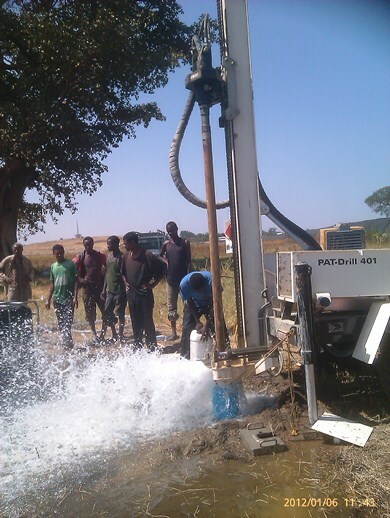 Water drilling to install irrigation equipment at SARI. The engagement with GCP has revolutionised bean breeding at SARI and institutionalised marker-assisted selection. As a result, SARI will soon have a small molecular breeding laboratory funded by another agency. This lab will support one more PhD student and an additional MSc student, both registered in Ethiopian universities and working on marker-assisted selection for beans. Thus, in this southern corner of Ethiopia, bean breeders conversant in molecular methods will continue to be ‘born’, better-prepared and well-equipped to meet the challenges facing bean breeding today. VIDEO: The ABCs of bean breeding – Asrat is joined by other TLI colleagues working on brean breeding, and they walk us through the paces of their work.